Listen to Gallery experts discuss aspects of the Indigenous collection and artists talk about their art-making practices. 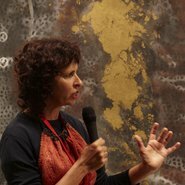 Waanyi artist Judy Watson discusses landscape and memory and the exploration and revelation of her personal history in her art. Emily McDaniel, assistant curator of Aboriginal and Torres Strait Islander art at the Art Gallery of NSW, will discuss Illuminate , an immersive installation created with paper, light and sound, currently on display in the Yiribana Gallery. Contemporary Kudjla/Gangalu artist Daniel Boyd discusses the exploration and interruption of post-colonial histories in his work. Wayne Tunnicliffe, head of Australian art at the Art Gallery of NSW, discusses the display of Indigenous art within the Australian galleries, focusing on the magnificent suite of bark paintings and tutini (Pukumani poles) collected in the late 1950s and early 1960s. Ken Thaiday will talk about his art-making practice and Beizam (shark) dance mask , his remarkable sculpture or 'dance machine’ in the Gallery’s collection. Steven Miller, head of the Edmund and Joanna Capon Research Library and Archive at the Gallery, will discuss the Australian Indigenous Artists Archive, a collection of unique digital material. Stephen Gilchrist, Indigenous curator, will discuss ideas of history and the ways some artists in the Gallery’s collection have challenged dominant historical narratives.